This post is a big THANK YOU to Bellini Valli of More than Burnt Toast: Thank you! We entered a giveaway not too long ago celebrating her two years of blogging. Wow, two years! That's a long time, in blogging-years. =) If you aren't already a reader of her blog, do go and check it out. Among the numerous entries, we were quite surprised and overjoyed to hear that we won! Since Bellini Valli is a fellow Canadian, the giveaway prize was a choice among a selection of Canadian cookbooks. We chose Laura Calder's French Taste: Elegant Everyday Eating . Recently, we've received a ton of cherries! One might say that we were a bit overrun with cherries. Looking at the cover of French Taste: Elegant Everyday Eating and seeing Laura Calder there with a bowl of cherries, we hoped that we would find a recipe using them. We also had some French bread that has been slowly deteriorating in quality, sitting on the counter for a few days. It was certainly très perdu! 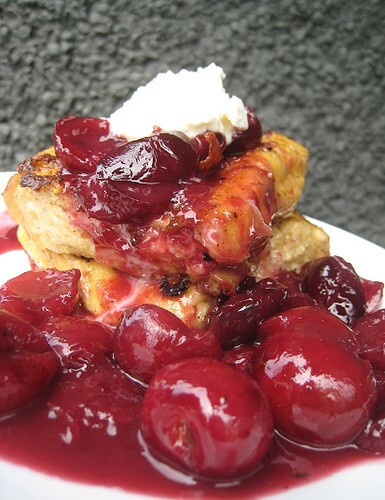 Our luck must still be with us, as we found this recipe for Pain Perdu with Sautéed Cherries. 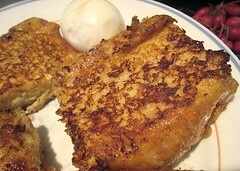 I was too lazy to do the extra step of brûléeing each French toast, but obviously that would be delicious. We didn't have ice cream to serve with it, so we topped ours with some ricotta. For the cherries, melt the butter in a medium sauté pan over medium heat. Add the cherries, turn the heat to high, and cook, stirring occasionally, for about 2 minutes. 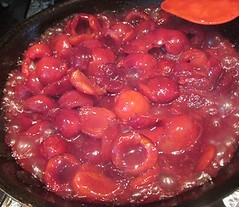 Scatter over the sugar, and continue cooking until the cherries break down somewhat, about 2 minutes more. Set aside. 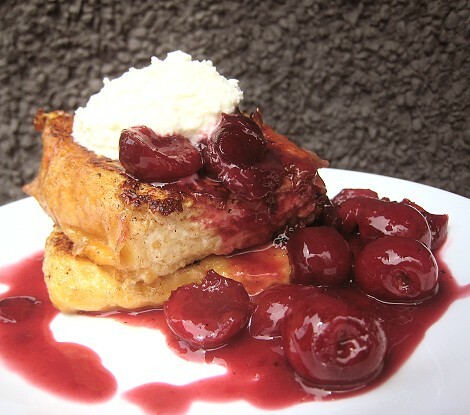 For the pain perdu, stir together the milk and vanilla in a shallow dish, and soak the bread slices in it for about 5 minutes, turning once so they absorb the milk evenly. Beat the egg with the sugar, and pour onto a plate. Heat the butter in a frying pan over medium heat until sizzling. Take the bread from the milk, holding it above the bowl to drain slightly. Dip into the egg mixture to coat both sides, then drop into the sizzling butter, and fry until golden brown, about 5 minutes per side. At the last minute, sprinkle the tops with a little extra sugar, and "broil" with a kitchen blowtorch (or place them on a baking sheet under the broiler until the sugar melts, bubbles, and turns golden). Divide the bread among serving plates. 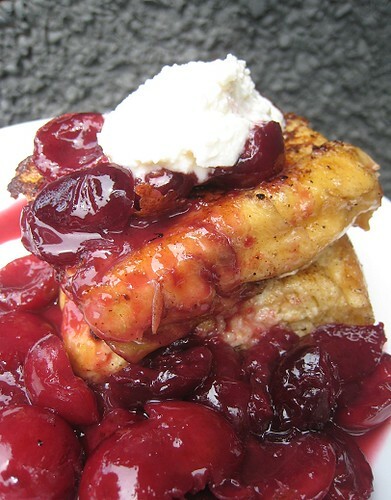 Serve hot with a scoop of ice cream and a spoonful of sautéed cherries. Glad to see you are tuking into all your cherries. Hope to see more recipes. I can't think of many things better than cherries to be overrun by :) Gorgeous!